Persons in earshot of the “mournful chord” will be reminded of the masters, pilots, mates, captains, deckhands, and boaters who responded to the call that day: “All available boats.” They may have heard the Coast Guard call or just knew in their guts what they had to do. 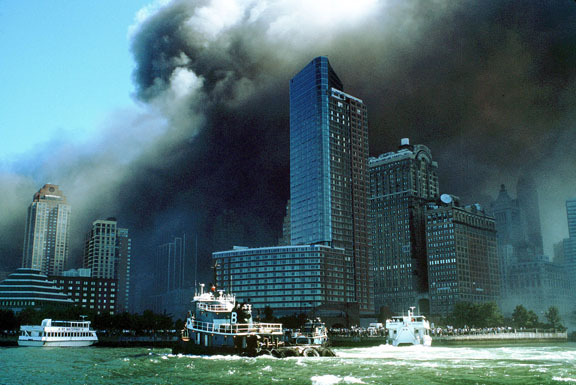 All Available Boats: Harbor Voices from 911 is a radio documentary by David Tarnow. Kimberly Gochberg, a sailing coach at Kings Point, is one of several voices providing their accounts. An illustrated book on the subject, All Available Boats, edited by Mike Magee, memorialized the maritime element that day. A gift from my colleagues, the volume is a tangible reminder to page slowly through. That morning the John J. Harvey, a retired NYPD fireboat went into action. It is a small photograph but it’s not difficult to see the deck crowded to capacity with people being ferried from Lower Manhattan. Co-owner Huntley Gill tells that story. The vessel a metaphor for age mattering little when one can lend a hand. An interview by Amy Eddings shines a useful light on the unanticipated urban design issue of waterfront infrastructure lacking as basic a detail as a cleat on which to tie a line.